Mission: To bring new and innovative medicine to patients sooner. Harnessing diversity for competitive advantage. Inclusion is how we harness the collective richness of our perspectives and expertise to deliver extraordinary performance. Diversity is what we each uniquely bring to our work. It encompasses both what meets the eye, such as race, gender or age, as well as attributes that may not be visible such as nationality, belief, experience and upbringing. The Company has provided in this press release and accompanying tables "adjusted" financial information that has not been prepared in accordance with GAAP, including adjusted EPS, adjusted operating income, free cash flow, and certain segment information. The Company believes these adjusted measures are useful to investors as a supplement to, but not as a substitute for, GAAP measures, in evaluating the Company's operational performance. Covance – Why Work For Us? At Covance, we are recognized as a leader in drug development because of our exceptional people. Our team is driven by an energized purpose to improve health and improve lives. Here, you’ll partner on diverse, industry-shaping initiatives across the drug development spectrum as you build relationships with thought leaders and supportive colleagues which will last a lifetime. Join us as we work together to create solutions that transform extraordinary potential into reality for our clients—and your career. At Covance, we understand, respect and value differences. We know that embracing the skills, cultures, ideas and experiences of every employee around the world gives us a clear competitive advantage. Our diverse perspectives make us a more insightful partner and reveal new opportunities for our clients. Our Employee Resource Groups range from advocates and allies for women, parents and veterans to our Covance Pride group; and from our GoGreen Committee to our Diversity Awareness Committee(s). Many members partner with local volunteer organizations too, building awareness and strengthening our bond with our communities. Create networking opportunities for employees with a common interest or culture. Strengthen our commitment to an inclusive working environment. Attract, develop, grow and retain proactive, insightful talent. Increase awareness of and respect for diversity and inclusion. Serve as ambassadors who deliver on Covance’s mission. We share your respect for the environment and are committed to integrity, diversity, inclusion and philanthropy. They’re not just good business practices. They make a difference and they’re the right things to do. We bring these core values to life in our business practices, in our relationships with our clients and strategic partners, and in our community. We believe helping improve people’s lives is our responsibility as well as our business, and we are committed to it. We recruit top talent from universities around the world. Technical excellence in a STEM (Science, Technology, Engineering & Mathematics) discipline is vital. But so are thought leadership, integrity, critical thinking, global perspective and creativity. If you’re keen to grow in a fast-paced, client-focused environment, find out how we prepare you for great things ahead. Why did you choose to work – and stay – with Covance? We heard many interesting stories about gaining experience on the job, earning promotions, mentoring and mapping out an ideal work/life balance. Take a peek at what our CRAs told us in our CRA talent community site. 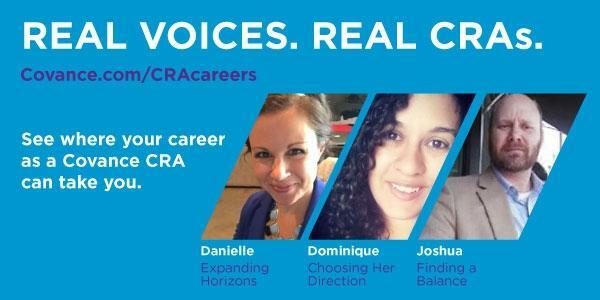 You’ll read real voices from real CRAs – and hopefully see why Covance is a great place to explore your extraordinary potential. "Forward thinking, good work/life balance"
None right at the moment. I applied through a recruiter. The process took 2 weeks. I interviewed at Covance (Bengaluru) in February 2018. A two round process with a Company senior proffessional along with an overseas manager will ask about your strengths and weaknesses. They test your skills and recognise your true potential. Glassdoor gives you an inside look at what it's like to work at Covance, including salaries, reviews, office photos, and more. This is the Covance company profile. All content is posted anonymously by employees working at Covance.